How to Fix Hard Drive that suddenly became RAW? To be specific, let us know about RAW. It is the default file system of CD-ROM that is recognized by Windows. In the literal terms we can say the hard drive that has not been formatted by FAT and NTFS file systems (NT file system), is called RAW hard drive. Now let us talk about a RAW hard drive in detail. What is Raw Hard Drive? It is the state when the operating system can’t recognize the file system of the hard drive at a certain moment. The RAW state of the hard drive usually occurs when the file system is corrupted or damaged and thus, the data becomes inaccessible and unreadable. The user is not able to access any part of the hard drive. We can take for example: at times when we remove the external hard drive while copying or writing, the drive becomes corrupt and turns RAW and many error messages pop up accessing data from such hard drives. Also the used space and unused space will all be shown as “zero”. This means that the data we have saved is now lost. The files might be of great importance to a user if this tragedy happens. The situation of the hard drive gone RAW is of two types. The first situation is that the whole hard drive has become RAW; and the other is one partition of a hard drive turns RAW. But before discussing this, we will talk about the error messages that pop up while the drive becomes RAW. RAW Partition: The damage is brought to one partition on a hard drive and the other partitions are in normal state. The error is displayed when we click on the drive– “The file or directory is corrupted and unreadable” or “You need to format the disk.” While seeing this message, people usually choose to format the drive but the result is that this process does a great data. What we can do on our part? After seeing these scenarios, the main question that pops up is that can we recover data from RAW hard drive? Yes, data on RAW hard disk is recoverable by using data recovery software. Use third party software like Stellar Phoenix Windows Data Recovery-Professional that will recover the data that is damaged to a great extent. In an addition, users must make a note that there is no need to panic or no need to restore or install the OS as it will not recover your lost data on the RAW hard drive, but instead it will make things worse. Step 1: Run Stellar Phoenix Windows Data Recovery software. 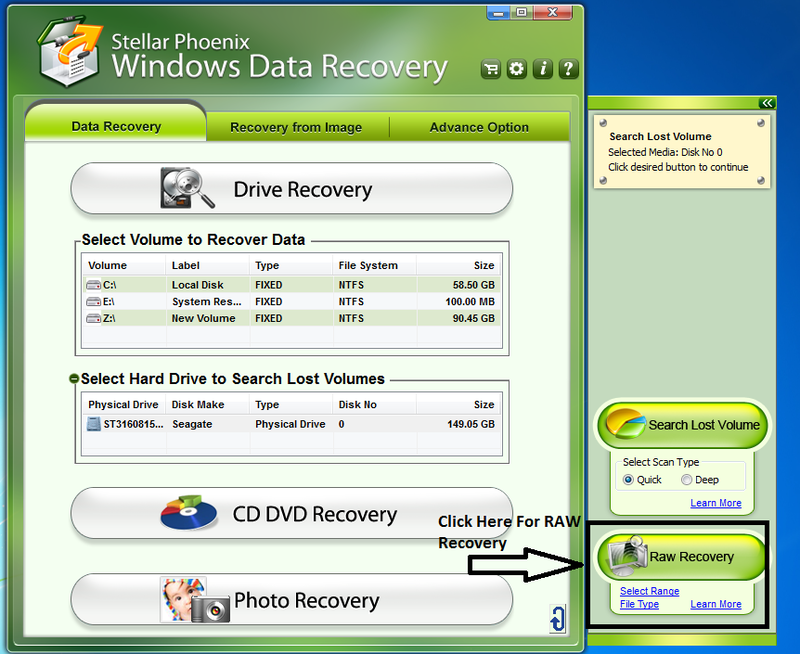 Step 2: There is a Drive Recovery tab, under that click Data Recovery button. Step 3: Select 'Click Here to Search Lost Volumes' in the main screen and then a section stating Hard Drive to Search Lost Volumes is displayed. Step 4: In 'Select Hard Drive to Search Lost Volumes', all physical drives are listed with their size. Select the drive that you want to scan. Step 5: Now, click File Type to select, add, edit, or remove file types. Now, for scanning entire hard disk, click Raw Recovery. For scanning selected region of the hard disk, click Select Range. In the 'Select Specified Region' screen, drag sliders to define the range. Click OK, and then click Raw Recovery. This time the scan will be performed on the selected region only. Step 7: The Scan will be performed on the selected source and the found files in the selected hard disk will be shown in the form of a progress bar. During scan, the software prepares a tree-structured list of recoverable files. Step 8: After the scan, all recoverable files and folders in the selected volume will be shown. Select those shown files and on clicking them, the preview of the files will be shown. Step 9: Select the desired folders you want to recover and now, click the Recover button on the bottom right corner. Step 10: A Select Destination dialog box is opened up. Here, browse for a desired location to save the recovered data and Click 'OK'. Step 11: The saving the selected files will be initiated now at the desired location. This simple easy-to-use software lets the user to also edit the header of a predefined file type and add new or unknown file headers to the existing list of files and conveniently performs recovery from any severely corrupt storage media.